Over the last 5 years I have come across a few places that are like this and I thought it would be good to talk about how I photograph them and how I then use post processing, before publishing my final results. A quick tip if you will! An overgrown chapel in Northern Italy, shot in April 2018. I find shooting these locations can sometimes be difficult especially if there is a breeze or stronger winds as this leads to the foliage moving in your frame, which of course is not something that you want in your final results. One trick that I have taught myself is to split the scene up in my mind, so shoot the greenery first which usually means faster shutter speeds and potentially higher ISO values so that you can get your shutter speed somewhere around 100th-200th of a second (but of course this depends very much on the strength of the wind). Once you have shot the overgrown areas and are happy, you can then revert your settings back to shoot the walls of the building or the interior, this is usually f/8, iso 50-160 and then letting the shutter speed fall on the central exposure line (I always shoot on manual settings but this works on aperture priority as well of course). I usually bracket both sets of images as well, as this then provides me with greater dynamic range and a choice of exposures. But of course you really need to protect those highlights when doing this - check each section of your frame carefully by zooming in upon playback when doing so. Once I have all of these files, I combine them together in the creative cloud suite, software such as Adobe Photoshop and of course Adobe Lightroom. To do this I use a simple “layer mask” and pain the areas in to the unedited image using a soft brush. Once done, I flatten the file and then begin my final edit. Vegetation takes over a garden inside a former Sanatorium in Georgia. Image - March 2018. This extra effort can be worth it and the results are much more desirable, especially if you are printing images or displaying them somewhere in large resolution. Imagine spending all that money printing a piece of work only to see the green leaves have all moved and blurred in your final print - it would not look great art all. A great example of this is when I was shooting the below chapel in the south of France back in 2016, heavily overgrown but as it was a windy spring morning the bushes were swaying side to side during each and every capture and would have looked awful in the final results. So here I shot two images only and blended those in post processing. First capturing the green areas before shooting the interior, you know once I was happy I had a sharp section to blend in later. The first capture at f/9, iso 100 gave an exposure time of 0.3 seconds. As it was windy look at the result on that bush on the right side. Just by raising my iso to 800, I was able to increase that shutter speed to around 1/125 sec - leaving a much more pleasing result on the bush on the right. Shooting the foreground and interior/architecture separately, I was able to blend them together later for sharper results. This is my final edit. I’ve applied this technique a lot of over the last 4 years in particular and here are some of the samples in which it worked very well to accompany the image above. These images were taken in abandoned places, such as chateaus, greenhouses, asylums and villas across Europe. I love overgrown locations to be honest. I hope you enjoy the full set, I shall be doing some more of these short written tutorials in the future weeks and months to accompany my new youtube channel. A disused asylum on the Italian island of Poveglia. The external of a derelict chateau in France. A bench inside a disused greenhouse in the south of France is some what taken back by nature. Baron Hill Estate in Anglesey has been derelict for years, this colonnade, before you get to the main castle is hidden between in the trees. The same former mental institution in Eastern Italy, a large complex that was a pleasure to walk around for 6 hours. We spotted this, the overgrown medical room. 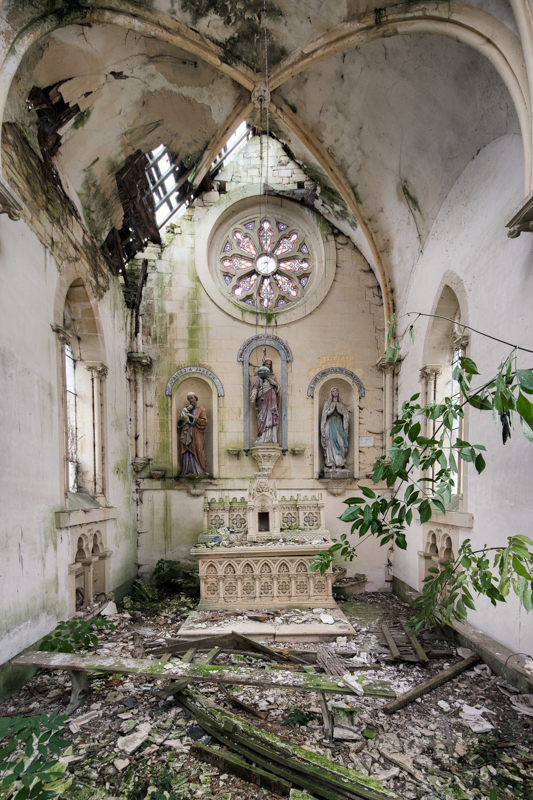 Nature starts to take back a Gothic Chapel in Western France. This Swedish automobile graveyard is a beautiful gallery of decay with nature taking a foot hold. Standing in this earthquake ruined chapel we thought we had missed the moment - seconds later the sky filled with golden light sending beams inside the collapsed roof - Italy at its finest! A fallen villa in Italy that I finally got to shoot earlier this year, after 3 unsuccesful attempts. It only took me, erm 4 years and three attempts to reach this spot. Good things that come to those that wait, right? An overgrown monastery in North-West Italy. Taken inside a derelict greenhouse in Belgium as the wind moved all the green around us. Ivy takes over nearly everything at this former orphanage in Belgium. A full forest takes over this abandoned and heavily decayed army barracks, over in Hungary.